It isn’t too far-fetched to say that the oil industry began over five thousand years ago. In the Middle East, oil that seeped up through the ground was used in paints, for lighting, and as waterproofing for boats and baskets. However, it wasn’t until the mid-1800’s that commercial petroleum (oil) production began here in the United States, with the completion of an oil well near Titusville, Pennsylvania. Titusville is located in the area of Oil Creek, a tributary of the Allegheny River, and that first Titusville well produced about 20 barrels of crude oil each day. Additional wells were soon drilled in the Oil Creek area, and shortly thereafter an oil refinery was built near Pittsburgh, about 75 miles away. Getting crude oil from the field to refineries was a challenge that needed to be resolved quickly. Since the first well was located adjacent to Oil Creek, water transport was the most obvious solution. Boats of various types, including steamers, passenger boats and towboats were hired to transport the “crude” down Oil Creek to Oil City, Pennsylvania. From there the oil was transferred to larger boats and transported down the Allegheny to the refinery complex in Pittsburgh. Some "runs" could transport as much as 20,000 barrels downstream to the refinery. However, groundings, collisions and other accidents resulted in oil spills, and spill losses had significant impacts on the environment as well as the economics of oil production. It soon became clear that moving oil by boats on inland waterways was too expensive and too hazardous. Railroads were looked upon as the next solution for transporting oil from the field to refineries. Around 1861, railroad tracks were laid to Titusville and other Pennsylvania communities close to oil production areas. From there, crude oil could be transported to larger markets such as New York. Rail cars designed to transport oil consisted of two large tanks mounted on a flatcar. These tanks were originally constructed of wood but were later fabricated from steel. Each tank held about 40 barrels of crude. To move the oil from the wells to railheads still required an initial trip by horse-drawn wagon. Wagons could carry 1,800 to 2,500 pounds of crude oil, in barrels. Up to 2,000 daily wagon trips were required to move oil to the railheads, and the costs paid to the wagon drivers – also known as teamsters – varied depending on the distance and the road conditions. 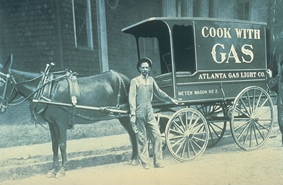 This method of transport involved many hazards, delays and high costs, as teamsters had to drive their wagons over poor roads in unpredictable weather conditions. Those problems provided incentives to develop a safer, more economic method of transporting crude oil to the refineries, and pipelines were proposed as the solution. Early efforts to develop pipelines were met with concerted and sometimes violent resistance by teamsters, whose livelihoods were threatened. The viability of early pipelines was also challenged by railroads. Railroads had effectively established a transportation monopoly that controlled the shipment of oil and dictated prices to oil producers and shippers. Railroads also constructed their own pipelines but refused to allow privately owned pipelines to cross their railroad rights-of-ways. These difficulties were later overcome by legislative and judicial actions that granted the power of eminent domain to common carrier pipelines. This led to the establishment of oil trunk line systems that connected wellhead areas directly to refineries, resulting in predictable, consistent and cost-effective delivery. 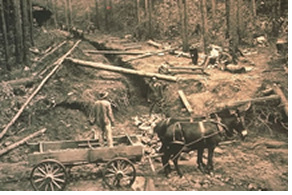 Early oil pipelines were made of wooden pipe with flow provided by gravity alone. Then in 1863 a pipeline was constructed from a Pennsylvania oil field to a nearby refinery over a distance of two and one-half miles. This line was constructed of two-inch cast iron pipe, and used three pumps to force the oil over a 400-foot ridge. It was soon abandoned, however, because the pumps proved inadequate to the task, and the pipeline itself leaked. Around 1865, wrought iron pipe was employed to overcome the leakage problems associated with wood and cast iron. The first wrought iron pipe moved petroleum distillates from a refinery at Clumer, Pennsylvania, to the Allegheny River, a distance of about three miles. 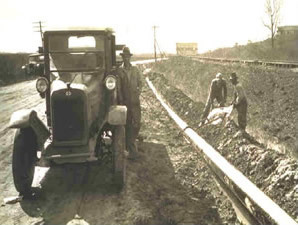 Subsequently, another wrought iron pipe transported crude oil from a production area to a railhead at Miller Farm, Pennsylvania. This line consisted of 32,000 feet (just over 6 miles) of two-inch pipe. Installed partially above ground and partially below, the pipeline made use of three pumps installed along the route and provided a throughput of about 81 barrels of crude oil per day. This line also had the distinction of having the beginnings of a flow data system - a telegraph line was used to relay data on the oil shipments. Additional pipelines followed these early examples, and by 1867 the cost to transport a barrel of oil was down from $2.50 to about 50-cents as a result of increased competition. Early oil production was accomplished by extracting oil from the well and storing it temporarily in tanks. Teamsters hauled these tanks to larger “dump tanks” at the pipeline. In 1866 the Accommodation Pipeline Company constructed a two-inch line across their production area, connecting well tanks directly to the pipeline dump tank. The cost for "gathering" the oil dropped from $1.00 to 25-cents per barrel, and this method of gathering was quickly adopted by other pipeline companies. To smooth out the up-and-down fluctuations between oil production and oil shipments, early pipeline companies began constructing tanks to provide oil storage. The tanks were originally built from wood and had a capacity of about 1,200 barrels. Later the wooden tanks were replaced with larger, stronger wrought iron tanks with capacities of about 15,000 barrels. 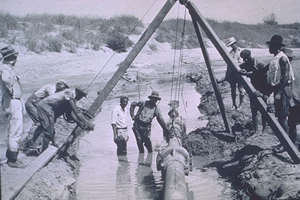 By 1870, pipeline companies had a combined storage capacity of some1 million barrels. Since that first oil well was put into service in Titusville, the American oil industry has grown steadily, reflecting the optimistic and innovative spirit of the nation. In recent years American companies have consistently produced approximately 2 billion barrels of crude oil per year.